The Future Renewable Electric Energy Delivery Management (FREEDM) system center, a National Science Foundation (NSF) engineering resource center located at NC State University, includes a green energy hub comprised of electronic protection, energy management, metering, advance energy storage (AES), bidirectional electric vehicle charging station, Real-time Digital Simulation (local and remote), and various distributed energy resource devices. Internal (on campus) Distributed Renewable Energy Resource (DRER) interfaces. This system demonstrates GEC’s ability to design, develop, integrate, and test communication and control system hardware and software applications. 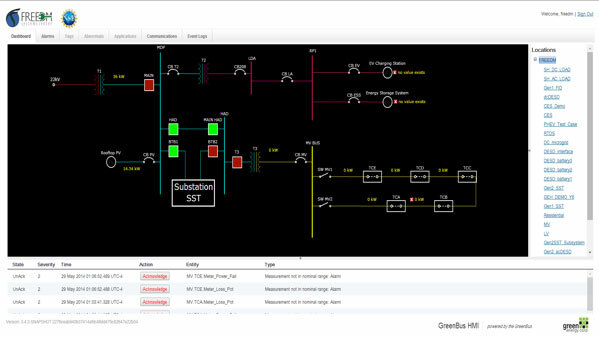 GEC’s GreenBus® microgrid solution implementation enables accurate, accessible and reliable measurements for energy management, control, and quality performance analysis and evaluation. GreenBus provides the required interoperability, scalability, and development tools for demonstrating, testing, and evaluating continuously evolving FREEDM developed power electronics, energy storage systems, distributed intelligence, and advanced power applications.